My latest blood test results are in. 47% PCV and 438k platelets. Yipee! The doc said I am doing really well. She does not want to reduce my medication anymore coz she does not want to risk a relapse although there is still a chance of relapse even with the medication. So it would be wonderful if they could find a cure. I have Evans Syndrome which is what they call it when AIHA/IMHA and IMT occur at the same time. Meisha's Hope Fund and Morris Animal Foundation have teamed up to find a cure for IMHA with Autoimmune/Immune-Mediated Hemolytic Anemia Fund #338. And we are helping them out by donating proceeds from one of Mommie's designs. So if you buy any of these products, the commission earned goes to help finding a cure. How cool is that? Click on the image below to see information about the disease and how we are helping to raise funds to find a cure. Here is a sample shirt with the design on it. 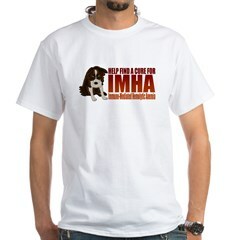 Check out the Canine Autoimmune Hemolytic Anemia message board. There are lots of people on there posting about their doggies and experiences with this disease. Here is a brochure with some helpful information. You can click on it to make it bigger. Happy New Year everyone! Not so happy for me coz Mommie is back at work. Sniff! We had 11 whole days together coz she did not have work over the holidays. It was great to have Mommie with me all the time. I went to three Christmas parties. At the first Christmas party, there were so many people walking around and kids running around so there were lots of bits of food on the floor. I was planning on patrolling for food all night long but Mommie kept putting me on her lap or behind her chair so that I could not scout for food. Darn! There were lots of food bits and even chocolate on the floor but I was not able to get any coz Mommie said those were no-no's for me. She picked up the food bits she saw and wiped the floor where she saw chocolate. Darn! It was real noisy so I asked a couple of times to go home. I sat by the door with my 'Let's go!' look but she said we should stay a while. One of the babies gave me lots of hugs and kept calling me. He has a big doggie but his doggie just lied down and slept for most of the party. I sniffed him a bit but he did not want to play. He is a really nice doggie and the baby loves to crawl on him. Hehe! Eventually people started to leave and I was able to roam freely when there were only a few people left and no one was eating anymore. But alas no presents for me at this party. Double darn! The next party was much better. I had loads of presents to open and lots of hugs and kisses. Woohoo! I got a lot of toys and I got so excited I did not know which toy to play with first. I also got a nice colorful water bowl with all sorts of super dogs on it. It was all adults so no food fell to the floor. Darn! The third party started during my dinnertime. All the kids wanted to feed me my dinner. So Mommie had them line up so they could hand feed me one at a time. I wore my red and gold ribbons and they said I looked real cute and gave me lots of hugs. I was a bit tired from all the festivities so the Mommies told their kids to let me rest and to make sure no food was on the floor. We stayed til morning coz the Mommies were playing cards. I also got a nice red coat with buttons and another water bowl with doggies on it. I was so tired after all those parties that I did not feel too well after Christmas. Mommie said I did not smile for 2 days. I did not feel like smiling coz I was so tired. So Mommie made me rest up. So I was back to party mode for New Year's. We just stayed home and my cousin, aunts, uncles and grandma came to visit. My good pal Pepe from last year also sent me a gift. I am eagerly awaiting it's arrival. It is too bad Pepe and I were not able to spend Christmas together this year. We had a blast last year. I also opened up the second present Hana sent me. It was an elephant that squeaks. Thanks for all the presents everyone! Hope you all had a great holiday! Here are some pix from the holidays. 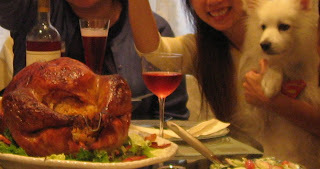 Everyone was looking at the camera for this picture but I knew a better place to look.. the Turkey! Yummm!!! Here I am opening some of my presents! Lookit all my loot! Some did not make it to the picture coz my presents arrived on different days. My pal Pepe's presents arrived! Lookit what he got me. Wowee! I love my cape so I even ate while wearing it. Uncle's aquarium is huge! Mine is just a little bowl. But his beta fish is the same size as mine! It was easy to spot him even in that big aquarium. 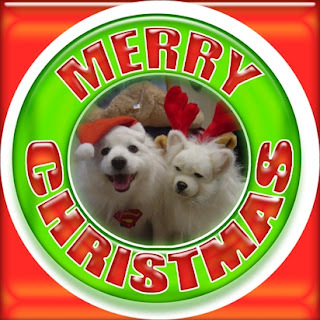 Here I am with Jasper in our holiday wear. I am Santa and he is the reindeer.